It�s the show this forty-year-old youth theatre company was born to do. Four decades after their first production of it, Mark Arapostathis now directs their most recent performance of their namesake musical classic. And with all their experience, not to mention a huge cast of inspired young performers from fourth grade to eighth, the story of the boy who never grew up is full of youthful magic. Ten-year-old Jamie Boyd leads us to Neverland as the title character with good singing and strong characterization, while heading up a huge assortment of Lost Boys who chime in with a nicely done Wendy song and a rendition of I Won�t Grow Up performed with enthusiastic certainty (each Lost Boy donning a different type of hat from coonskin to aviator to an old football helmet). Joining them are, of course, the adventuresome and delighted Darling siblings Wendy (Kailey Vigil), John (Ben Kesner), and Michael (Zoe Zawacki) who fly above the stage with Peter to Neverland, with Wendy also joining with Peter in a good duet and delivering an amusing narration of Hamlet�s grim ending. Eventually joining forces with the Lost Boys are some dynamic Indians led by Tiger Lily (Sierra Orsinelli-Rivers). 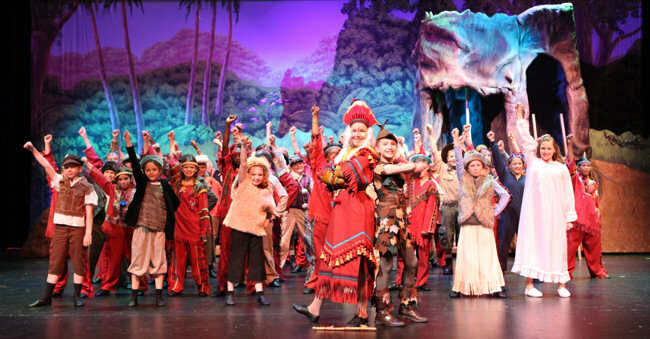 And they�ll need all the help they can get against the sinister pirates of Neverland led by the nefarious Captain Hook who has every intention of making sure Peter Pan and his gang never grow up. In this case, it�s a huge band of pirates Peter must contend with � enough to dance a big tango with other pirates accompanying them with instruments. Those pirates carry their evil captain out onto the stage in a big litter (and then accidentally/purposely drop him). They are also eager to sing a little Disney-ish Yo Ho, Yo Ho before Smee interrupts them with a disheartening clarification of copyright law. Smee (Sam Alper) is a riot as Hook�s adoring valet using great comic timing, personality, and voice. Parker Stevens plays the object of Smee�s infatuation, transforming himself from stiff and prim Mr. Darling childishly afraid of medicine to the hilarious Hook who relishes his diabolical nature, almost relishing it too much as he starts to laugh gleefully while slipping poison into a sleeping Peter�s medicine before catching himself and realizing that he doesn�t want to wake his nemesis up. He leads all his pirates in a terrific musical number named after himself. 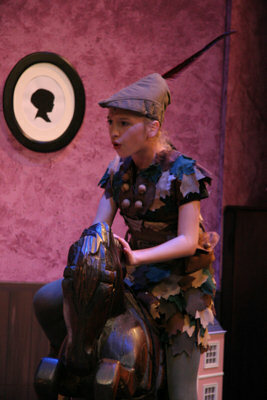 The show is full of impressive production values to complete the magic spell, including great costumes and charming sets of the Darling house and Neverland, all those sets kept clean by an industrious maid Liza (Shannon Wooldridge) who happily dusts off all the forested nooks and crannies of Neverland, right down to Peter�s bottom.